U.P // Year 1: Holy Holidays Batman, check out Batgirl! This day belongs to Erin Madeleine. "this is brilliant, the dress is adorable and so are you. so excited to rock the LBD and support the cause." Holy Holidays Batman, check out Batgirl! 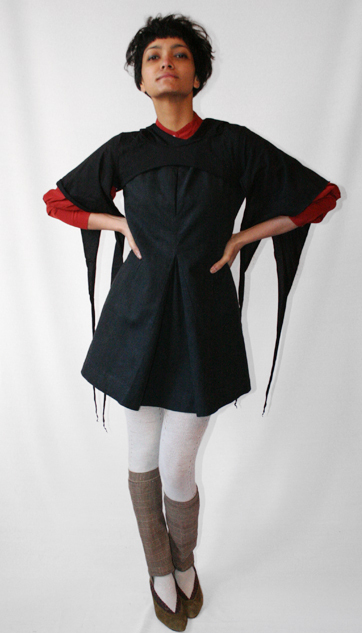 Batwing hoody donated by Alanna Hibbard from her store at poutfits.etsy.com. Silk blouse donated by Helena, leg warmers donated by Lisa Halverson from her store, frillbylisa.etsy.com. Vintage suede pumps from eBay. @Wendie; Who knows if she's growing? I just hope her hair grows so I can cut it! Cute leggings, girlie! Today Batty is a good thing! You look lovely and the halo of your hair in pic one reminded for a minute of St. Lucia day. May your holiday season continue to be merry and bright. Wow! !Transition unimaginable!The third picture is so sweet..Love those leg warmers the best. Felt so proud of U reading that long Etsy Interview..Well done U.P ladies!! Sorry, but I have to give it two thumbs down. Uhmmmm...no! The hoody is OK, but I'm afraid the rest does not flll me with songs of praise! Sorry! not a favorite. at all. cute shoes! the leg warmers are awesome. not a favourite, but it's interesting. Kind of like the batwings, but less crazy about the eclectic color mix today. Keep creating! Okay, that hoodie is some kind of awesome. so cute and chic! love the hoodie! Batty in the best sense of the word. I love my rust colored poutfits hoodie too!